Draft: 2005, Milwaukee Brewers, 7th rd. Michael and his wife, Melissa, reside in Port St. Lucie, Fla., with their children Giovanni, Maxwell, Michael III and Mariah...Graduated from Fort Pierce Central High School (Fla.) in 2005, where he played baseball and golf...Was selected by the Brewers in the seventh round of the 2005 MLB Draft...Is the son of former Major League outfielder Mickey Brantley, who played for the Seattle Mariners from 1986-89 and was on the Toronto Blue Jays coaching staff from 2005-07...Was acquired by Cleveland as the player to be named later in the trade that sent CC Sabathia to Milwaukee in 2008...Signed a two-year contract with the Astros as a free agent on Dec. 19, 2018, a deal that will keep him in Houston through the 2020 season. Was an AL All-Star for the second consecutive season in a year where he finished fifth in the AL and eighth in the Major Leagues in batting average (.309)...became the first Cleveland outfielder to be selected to consecutive ALl-Star games since Grady Sizemore (2006-07)...ranked second in the Majors in strikeout rate (9.5%) behind only Andrelton Simmons (7.3%)...ranked seventh in the AL in hits (176) and ninth in multi-hit games (51)... posted an .832 OPS (.364 OBP/.468 SLG) along with 36 doubles and 17 home runs...against right-handed pitchers, batted .321 (fourth-best mark in the AL) with 31 doubles, 14 home runs and an .889 OPS (.380 OBP/.509 SLG)... made 134 starts in left field and seven at designated hitter...led Cleveland with six outfield assists...began the season on the DL as he was rehabbing his surgically repaired right ankle...was activated from the DL and made his season debut on April 6...spent the entire rest of the season on the Indians active roster...connected for his first-career grand slam on May 1 vs. TEX off Keone Kela in what was his 3,930th career plate appearance...hit his second-career grand slam just nine games later on May 11 vs. KC off Jason Hammel...posted a club season-high 19-game hitting streak from May 19-30, tied for the second-longest streak in the Majors during the season... recorded his 500th career RBI on July 5 at KC...played his 1,000th career game on July 28 at DET... hit a walkoff RBIsingle in the 9th inning on Aug. 9 vs. MIN...hit a walkoff RBI-single in the 11th inning on Sept. 22 vs. BOS...played in all three games of the ALDS against the Astros, going 2x10 with a walk and an RBI. Season never fully gained traction as he was limited to just 11 games at the Major League level around two stints on the disabled list and did not play in a game after May 10....Was on the active roster from April 25-May 9, his last game coming on May 9 at Houston...Originally injured the shoulder on Sept. 22, 2015 diving for a fly ball at Minnesota. Progressed smoothly in spring training from November 2015 right shoulder surgery (Dr. Craig Morgan) and appeared in 2 spring training games, March 19-21, before being shutdown for the remainder of the spring in order to back date his DL stint... Was placed on the 15-day Disabled List on March 25 and rehabbed between AA Akron and AAA Columbus, April 12-23, before being activated on April 25...Hit safely in 6 of his 11 games with Cleveland and equaled his career-high (11th time) with 4 hits vs. Detroit on May 5...Persistent soreness and biceps tendonitis forced him onto the DL for the second time on May 10...Received several cortisone shots and visited several shoulder specialists after a failed rehab, July 11-17, at A Mahoning Valley, A Lake County and AA Akron for his chronic biceps tendonitis and underwent a diagnostic ultrasound and hydrodissection of the tendon on July 22 at the Cleveland Clinic...Was shutdown for the season on August 3 after feeling more soreness...Underwent surgery on August 15 in Dallas, TX to address chronic biceps tendinitis in the shoulder...The procedure commonly referred to as a biceps tenodesis re-attached the tendon from his shoulder to his humerus...The 45-minute procedure was performed by Dr. Keith Meister and Dr. Mark Schickendantz...The doctors confirmed his previous labrum repair was intact, the remainder of the shoulder joint looked good with a 4-month recovery time. Enjoyed another elite offensive season for the Indians, becoming just the third Indians batter since 1961 to pace the American League in doubles, netting a career-best tying 45... His Major League-leading 45 doubles were the most by an Indians batter since Grady Sizemore led the A.L. with 53 in 2006...Finished 4th in the American League batting race at .310 behind Miguel Cabrera's league-leading .338...Also ranked among American League batting leaders in a variety of categories (see box at right) and was the hardest batter to strikeout in the American League at 11.7 plate appearances per strikeout (drew career-high 60 walks against just 51 strikeouts). Got better as the season went along after being slowed by lower back stiffness in April (missed 6 games, April 8-15), hitting .335 (75-221) in 58 second half games with 33 runs, 21 doubles, 10 home runs and 38 RBI...Finished 6th among A.L. hitters in second half batting average, on-base pct. (.400) and OPS (.963) and was 4th in doubles after the break...Hit .406 (39-96, 2nd-highest in MLB) in 24 August games with 19 runs, 10 2B, 3HR & 17 RBI... Enjoyed his third career 2-homer game on August 25 vs. Milwaukee and his fourth career 2-HR game on Sept. 10 vs. Detroit (both homers came after the 6th in tie game)...From August 3 thru the end of the season he batted .333 (55-165) with 15 2B, 7 HR & 28 RBI in 42 games...Missed 3 games with left shoulder soreness, August 14-16, and was limited to just 2 games over the final 12 games of the season after straining his right shoulder diving for a ball in Minnesota on Sept. 22nd. Made 94 starts in left field (101 games), 24 starts in center field (28 games) and 17 starts at designated hitter for Terry Francona...Batted third in the lineup in all of 135 starts...Reached via hit or walk in 115 of 135 starts and hit safely in 104 of those assignments...Recorded his 9th and 10th career 4-hit games on April 26 at Detroit and July 22 at Milwaukee... Finished T-3rd in the A.L. with 23 May RBI and hit above .281 over each month of the season, including .339 (20-59) in April. Was once again at his best with runners on base, hitting .329 (82-249) with men on (6thbest in A.L.) to raise his career mark with runners on base to .322 (410-1275)...Batted .324 (45-139) with RISP this season, the 10th best mark in the league to raise that career split to .329 (232-705)...Joined the likes of Speaker, Sewell, Lajoie, Hale, Boudreau (done last in 1947) and Averill among franchise hitters to collect 45 doubles, at least 60 walks and strikeout fewer than 55 times. Enjoyed a breakout season as he earned his first American League All-Star selection and Silver Slugger Award and finished 3rd in the A.L. MVP voting...Led the club in runs scored, hits, doubles, RBI, steals, runs created and batting average and set career-highs in each of those categories and also set career-bests in home runs (20) .... Ranked among American League leaders in many categories. Became the first Indians player to amass 200 hits, 45+ doubles, 20+ HR, 20+ stolen bases in the 114-year history of the franchise and the 9th player all-time in the history of baseball to accomplish the feat ... Became the ninth p layer (16th total time) in club history to enjoy 20 homers and 20 steals in a single-season, the first since Shin-Soo Choo in 2010...Became the first Indians hitter since Kenny Lofton in 1996 (just 2nd hitter in Progressive Field-era/1994) to amass 200 hits in a season, collecting his 200th hit on Sep t. 27 vs. Tamp a Bay (had 29 hits over his last 17 games, 18th p layer/28th time in club history)...His .327 batting average was highest by an Indian since Roberto Alomar (.336) in 2001. Enjoyed a p air of club season-high 15-game hitting streaks from May 14-31 and Sept. 11-24 and was the model of consistency all season, hitting .341 (176-516) with 41 2B, 16 HR and 78 RBI in 130 games from Ap ril 29 until the end of the season...Carried it over from 1st half to 2nd half as well as his .901 first half OPS (9th) and .877 2nd half OPS (5th) each ranked in the top 10 in the league (min 225P A) ... From July 31-end of season he hit .354 (74-209) with 18 2B, 5HR, 32 RBI over his final 53 games ... From August 29th thru the end of the season Michael batted .408 (49-120) with 12 2B, 2 HR and 15RBI in the season's final 30 games to raise average from .307-.327. Made 106 starts in left field, 40 starts in center field and 8 starts at designated hitter and was a 2014 finalist for the Rawlings Gold Glove Award...His error on April 2 at Oakland (night game) snapped an outfield club record 247 consecutive errorless games (only error of the season)… Ended the season with 144-game errorless streak and has just 1 error over his last 393 games since June 3, 2012....His 12 outfield assists were T4th among American League outfielders (33 career). Equaled single-game club record for runs scored (5 runs, 3-for-3, HR, RBI, 2BB) on June 9 at Texas, becoming the first Indian w/5 runs in a game since Joe Carter in Sep t '86 and went on to win A.L. player of the week honors (6/9-15)...E njoyed his 5th career-game of at least 4RBI April 17 at Detroit (season-high)… Had RBI in 66 of 156 games with an at bat (had seven games of at least 3RBI). Connected for two extra inning walk-off home runs, the first two game-enders of his career (May 20 vs. Detroit, August 3 vs. Texas)...W as the 3rd hardest batter in A.L. to strikeout, fanning in just 1 every 12.1 p late ap p earances, trailing only Victor Martinez (15.3) and Jose Altuve (13.3)...His home batting average of .353 (106-300) was 3rd-best in the American League....Hit 3rd in the lineup 126 times...Over the last two seasons has hit a combined .329 (159-484) with runners on base and .375 (101-269) with runners in scoring position...Did not start, June 17-20, with concussion symptoms. ?joyed another solid campaign, steady at the plate while providing stellar defense in left field after the off-season acquisitions of Drew Stubbs and Michael Bourn...Did not make an error the entire season and carries a franchise record 245 game errorless streak heading into the 2014 season...Broke Rocky Colavito's 212-game streak that stretched over two tenures with the club from 1959-66...Last error was June 3, 2012...Also finished tied for 4th with 11 outfield assists, the most by an Indians left-fielder since Albert Belle (11) in 1996....Made 144 starts in left field (151 games, appeared in 1 game in CF)...Led the team with a .284 average and was 3rd on the team w/73 RBI (career-high). ?njoyed his first career multi-home run game on June 19 vs. Kansas City and set new single-game career-highs in total bases (10), extra base hits (3) and RBI (5) on July 7 vs. Detroit, his second career 2-home run game in 2013....Hit .311 (32-103) in May with 3 2B, a HR and 17 RBI in 29 games...Indians were 40-14 (.741) when he scored a run...Reached base in 113 of 149 games via hit, walk or hit by pitch. ?as the club's best hitter with runners in scoring position as his .375 (45-120) mark was 3rd-highest in the American League...Also hit .311 (74-238) with runners on base and .364 (24-66) with RISP-2outs...Missed 2 weeks spring training (late Feb/early March) w/a left forearm cut suffered sliding into third base at Oakland that required double-digit stitches. Was the club's best hitter down the stretch, hitting .343 (34-98) with 4 2B, 2HR & 14 RBI over the final 26 games from August 28th thru the end of the season....Collected four straight 3-hit games, Sept 22-26, the first Indians batter to do so since Kenny Lofton in June 1995 and the first Indians hitter since 1959 (Minnie Minoso) to have four straight 3-hit games at least 1RBI in each of those games (Michael drove in 7 runs in the 4 games)...Ranked among American League leaders in pct of swings that missed (2nd, 9.9%, 92 of 933), pct of swings put into play (4th, 53.5%, 499 of 933), batting average with two strikes (5th, .270, 63-for-233) and steals of third (T4th, 6). Had a solid season from an offensive standpoint, making all of his appearances in center field after the spring training injury to Grady Sizemore...Had a career-high 22-game hitting streak, the longest by an Indians hitter in 2012, from May 20-June 15, hitting .337 (29-86) over the streak with 12RS, 4 2B, 16RBI to raise his batting average from .255 to .284...It was the 2nd-longest streak in the Majors in 2012 (Robinson Cano 23G) and the longest by an Indians hitter since May of 2007 (Casey Blake, 26 games)...Among AL leaders he finished tied for 12th with 37 doubles and was the toughest batter to strikeout in the league (10.9PA per SO). ..Started 1 of the final 9 games of the season due to a strained right groin...Hit at least .250 in every month of the season and hit .288 in both the first and second half. Also hit in 13 straight games from June 28-July 15 and over his last 78 games of the season from June 28th-on he hit .302 (81-268) with 31 runs, 16 2B, 5HR, 26RBI...Also hit .313 (21-67) the last 21 games of the season in Sept/Oct with 11RS, 2 2B, 5RBI...Stole 12 bases in 21 attempts (57%) and was tied for 4th in the AL in caught stealings...His .310 average on the road was 7th-highest in the American League while his .305 (53-174) average after the 6th inning was 9th-best...Also was 3rd in the league in pct of swings that missed at just 8.4% (73/865) and tied for 6th in intentional walks...Was 14th in avg vs. RHP (.299) and 11th in avg with the bases loaded (.444, 4/9). Enjoyed a great deal of success in the 5-spot in the batting order, hitting .308 (73-237) with 15 2B, 4HR, 31RBI in 65 games in that spot in the order...Batting average in the clean-up spot, where he made 24 starts, was .225 (20-89) with 4RBI...Best month was July when he batted .326 (29-89) w/7 2B, 3HR and 11RBI in 26 games (.934OPS)...For the year hit .295 (72-244) with runners on base...Made 140 starts in center field (3GS at DH) and compiled a fielding pct of .997 (1E, 5 assists, 342TC) which was 5th-best among AL outfielders...Underwent surgery to repair sports hernia after the season on October 11 in Philadelphia, PA (Dr. William Meyers). Put together a solid campaign before right wrist and hand problems ended his season on August 22nd...At the time of his injury was tied for 25th in the AL and 2nd on the team in runs scored (63) and tied for 17th in triples (4)...Was placed on the 60-day DL on August 23 and underwent right hand surgery at the Cleveland Clinic (Dr. Thomas Graham) on August 31 to remove a fractured hamate bone in his right hand...Was limited to just 14 games in August (.211, 12-57) due to right hand and wrist soreness...On the year he made 46 starts in center field (52G) and 62 starts in left field (66G)...Made 1 start at DH...His 7HR/46RBI were new career-highs...Had a season-long 9-game hitting streak to begin the season, April 1-11...Career-high 4RBI May 16 @KC...Notched his 4th career 4-hit game on July 8 vs. Toronto (4-6, 2RBI)...Over his last 33 games from July 6-August 22 he hit .281 (39-139) w/18RS,10 2B, 3B, HR, 13RBI & 11 multi-hit games...Hit .294 (30-102) in July with 6 2B, 1HR & 11 RBI in 24 games...Had a .782 OPS vs. RHP...Hit .278 (97-329) in the lead-off spot, .327 (51-156) with runners on base (9th best in the AL) and .302 (13-43) with RISP-2outs. Was the club's opening day left fi elder and spent three stints with Cleveland and ended the season in regular dutypositioned to be a contributor in 2011...First two stints were not met with a great deal of success, hitting .156 (5-32) inApril with a 2B, 3RBI in 9 games before being sent out to AAA Columbus on April 19....Recalled again on July 4 (Choothumb injury) and hit .157 (11-70) in July w/a 2B, HR & 4RBI in 17 games before being optioned back on Columbus onJuly 27...Combined over fi rst two stints hit .157 (16-102) with 2 2B, 2HR & 7 RBI in 26G (12RS)....Spent the remainder of the season with Cleveland after August 6th recall and rebounded to hit .292 (57-195) with 26RS,7 2B, 3 3B,2HR & 15 RBI in 46 games (.332OB/.390SLG/.721OPS) to raise his avg from .157 to .246...Hit in 37 of hislast 41 games (.295, 52-176)...Overall fi nished 7th among AL rookies in runs (38), 8th in hits (73), T3rd in triples (3)and T2nd in SB (10)...Hit first Major League home run on July 8 at Tampa Bay off Wade Davis to lead off the game...Equaled career-high with 4 hits on August 12 vs. Baltimore....Defining moment of his season came during a career-best 19 game hitting streak from August 30-Sept. 19 over whichhe hit .286 (26-91) w/1RBI...Was tied for the 4th longest streak in the AL this year...Was the longest hitting streak byan Indians rookie batter since LARRY DOBY (21G) in 1948 and longest overall since CASEY BLAKE in 2007 (26G)...Overall he in 27 of his last 29 games from August 30th-on (.283, 36-127)...Overall made 62 starts in center field (65G) and 7 starts in left field for Manny Acta...Hit .291 (23-79) in August with14RS & 11 RBI in 19 games...Overall on the year with the Indians hit .256 (67-262) when batting leadoff in 60 games(34RS)...Hit .304 (31-102) with runners on base and stole 10 bases in 12 attempts (83%)...Made 2 errors in 163 totalchances (.988)....This year at Columbus he hit .319 (87-273) with 54 runs scored, 13 doubles, 2 triples, 4HR and 29RBI in 67 games...At the time of his final August 6th recall he ranked 2nd in the International League in average (.319) and during his 2ndstint in Columbus in July he hit .344 (11-32) with 4 doubles, a home run and 3RBI in 8 games...During his first stint therefrom the end of April to the beginning of July he hit .315 (76-241) with 9 2B, 2 3B, 3hR & 26 RBI...Had two 12-gamehitting streaks with the Clippers...Hit .353 (36-102) in June with 5 2B, 2HR & 15 RBI in 24 games (18RS, .893OPS),.343 (34-99) with runners on and .310 (18-58) with RISP at Triple-A. Enjoyed a very productive season at AAA Columbus at just 22 years of age before an impressive September call-up in his debut at the Major League level...Hit .267 (122-457) with 80 runs scored, 21 doubles, 2 triples, 6 HR and 37 RBI in 116 games for the Clippers and stole 46 bases in 51 attempts (90.2%)...He finished tied for 1st in the International League in stolen bases (46) and 3rd in the league in runs (80). He hit in 7 of his last 8 games at Columbus, batting .382 (13-34) with 5 runs scored, 3 doubles, a triple, a HR, 5 RBI & 7 stolen bases...During the month of August Michael hit .298 (25-84) with 11 runs, 5 2B, 13B, a HR and 8RBI in 21 games, his highest average of any month this year...Stole 3 bases on August 31 vs. Louisville, his 2nd 3 steal game of the season...From June 1 thru August 31 he hit .282 (77-273) with 11 2B, 4HR, 49RS & 37RBI in 69 games...Was 7th in the IL in walks (59) and struck out just 48 times in 528 plate appearance (1K:11PA)...Hit .268 (90-336) off RHP and .264 (32-121) off LHP and .275 (41-149) with runners on base...Contract was purchased from Columbus on Sept. 1 and made his MLB debut that night in Detroit, collecting his first hit off Edwin Jackson in the 5th inning...Hit safely in his first 8 games with the Indians, just the 2nd Indians player in the last 50 years to hit safely in his first 8 games (Josh Bard, 2002, first 9 games)...Went 4-5 w/an RBI on Sept. 12 vs. KC, becoming the first Indian since Andy Allanson in April 1986 to have a four-hit game within his first 10 games played...Since 1954, he is the 7th fastest Indian to record a four-hit game (10g)...Rocky Colavito did it in his 4th game in Sept 1955...According to Elias only one Indians player has had a four-hit game at a younger age than Brantley (22 years, 120 days old) when Carlos Baerga recorded four hits against the Yankees on September 20, 1990 at the age of 21 years, 320 days old...Overall reached safely via hit or walk in his first 12 games and for the month reached safely in 25 of 28 games...Made 7 starts in LF and 19 starts in CF for the Indians when Grady Sizemore was shutdown on Sept. 4 and hit in the lead-off spot 23 times as well...Stole 4 bases in 8 attempts...Hit .375 (15-40) with runners on base and .474 (9-19) with RISP. Brantley spent the entire 2008 season at Class AA Huntsville of the Southern League where he posted an on-base percentage of .395 with 80 runs scored, 17 doubles, 2 triples, 4 home runs and 40 RBI in 106 games...He also stole 28 bases in 36 attempts and compiled a batting average of .319 (134-420)...He was tied for 6th in Southern League in runs (80) & steals (28), was 7th in batting average (.319) and 12thin on-base % (.395) despite an ankle injury that limited him to 4 games in July...He had nearly twice as manywalks (50) as strikeouts (27) and ranked second in the entire minor leagues w/a strikeout per plate appearanceratio of 17.7 (27K in 479 PA)...The versatile Brantley appeared in 62 games in center field and 21 games at both left field and first base...Hewas named to the Southern League mid-season and post-season All-Star Team and was named in BaseballAmerica as the Best Baserunner and having the Best Strike Zone Judgment in the Southern League...The 6'2",left-handed hitter compiled virtually identical on-base percentages off both right-handed (.397) and lefthandedpitching (.390) while hitting .351 (53-151) for the season with runners on base (.309 w/RISP)...After the season he was named the 18th best prospect in the Southern League by Baseball America...Brantley owns a career minor league on-base % of .399 with 53 2B, 7 3B, 6HR & 157 RBI in 383 games (.311BA, 433-1392) since being selected in the 7th round of the 2005 draft by Milwaukee out of Ft. Pierce Central High School (FL)...In his minor league career he has 199 walks compared to just 142 strikeouts (1K per 11.5PA) and has stolen 103 bases in 132 attempts (78%)...Enters 2009 as the 9th best prospect in the Indians organizationaccording to Baseball America. A West Virginia & AA Huntsville he stole 35 bases and drove in a career-high 53 runs in 115 games..Began the season at Class-A West Virginia where he hit .335 (73-for-218) in 56 games...Was promoted to Double-A Huntsville on 6/9...Rated by Baseball America as the Brewers prospect with the Best Strike-Zone Discipline. Placed on the DL on 5/3 with a right shoulder strain, reinstated on 5/13...Recorded an on-base percentage of .402, good for fourth in the South Atlantic League...Tied for seventh in the SAL with a .300 batting average. Began the season with the Rookie Arizona Brewers before a 8/28 promotion to Rookie Helena...Hit .343 (71-for-207) overall in his first season...His 60 hits with Arizona were good for 5th in the Arizona League...Batting average of .347 was 4th best in the Arizona League. 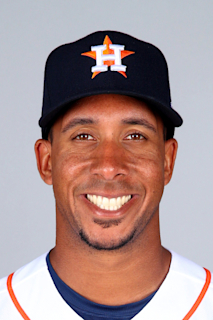 December 19, 2018 Houston Astros signed free agent LF Michael Brantley. October 29, 2018 LF Michael Brantley elected free agency. April 6, 2018 Cleveland Indians activated LF Michael Brantley from the 10-day disabled list. March 29, 2018 Cleveland Indians placed LF Michael Brantley on the 10-day disabled list retroactive to March 26, 2018. Rehab, right ankle surgery. September 30, 2017 Cleveland Indians activated LF Michael Brantley from the 10-day disabled list. August 9, 2017 Cleveland Indians placed LF Michael Brantley on the 10-day disabled list. RIght ankle sprain. June 26, 2017 Cleveland Indians activated LF Michael Brantley from the 10-day disabled list. June 16, 2017 Cleveland Indians placed LF Michael Brantley on the 10-day disabled list. November 7, 2016 Cleveland Indians activated LF Michael Brantley from the 60-day disabled list. July 15, 2016 Cleveland Indians sent OF Michael Brantley on a rehab assignment to Akron RubberDucks. July 13, 2016 Cleveland Indians sent OF Michael Brantley on a rehab assignment to Lake County Captains. July 11, 2016 Cleveland Indians sent OF Michael Brantley on a rehab assignment to Mahoning Valley Scrappers. May 14, 2016 Cleveland Indians placed LF Michael Brantley on the 15-day disabled list retroactive to May 10, 2016. Right shoulder inflammation. April 25, 2016 Cleveland Indians activated LF Michael Brantley from the 15-day disabled list. April 21, 2016 Cleveland Indians sent OF Michael Brantley on a rehab assignment to Columbus Clippers. April 14, 2016 Cleveland Indians sent OF Michael Brantley on a rehab assignment to Akron RubberDucks. April 12, 2016 Cleveland Indians sent OF Michael Brantley on a rehab assignment to Columbus Clippers. November 2, 2011 Cleveland Indians activated LF Michael Brantley from the 60-day disabled list. August 28, 2011 Cleveland Indians transferred CF Michael Brantley from the 15-day disabled list to the 60-day disabled list. August 26, 2011 Cleveland Indians placed CF Michael Brantley on the 15-day disabled list retroactive to August 23, 2011. Right wrist inflammation. August 6, 2010 Cleveland Indians recalled Michael Brantley from Columbus Clippers. July 27, 2010 Cleveland Indians optioned Michael Brantley to Columbus Clippers. July 4, 2010 Cleveland Indians recalled Michael Brantley from Columbus Clippers. April 19, 2010 Cleveland Indians optioned Michael Brantley to Columbus Clippers. September 1, 2009 Cleveland Indians selected the contract of Michael Brantley from Columbus Clippers.